Reigning Rugby League world champions, Bradford Bulls have been a pre-eminent force for the past decade and previously - as Bradford and Bradford Northern - a major power and occasional cannon fodder in the most uncompromising of sports. 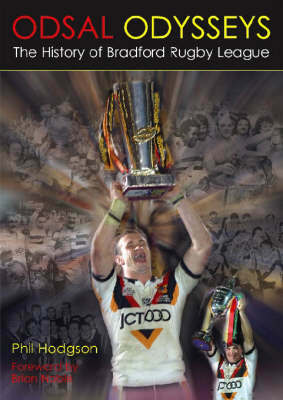 Rugby League journalist Phil Hodgson has charted, in "Odsal Odysseys", the glory years and the dramatic fluctuations in fortunes since the original Bradford club was formed in 1863. Three successive Wembley appearances in the late 1940s, together with the mystery of the 69,000 fans who subsequently "went missing" and the misery and magic of Northern's collapse and rebirth in the early 1960s - leading to successive championships - are chronicled. And, the rousing tale is told of the era prior to Bradford Northern, so named as an act of faith in professional rugby, when Bradford (Park Avenue) and Manningham (Bradford City), who were the first Northern Union champions, switched to soccer. Manningham and Bradford were leading lights in the Victorian era and the keen rivals' imaginative approach has been echoed by those visionaries who ensured that Odsal embraced to the full the all-singing, all dancing era of Super League - while never neglecting to provide a distinctive brand of scintillating football rarely matched elsewhere.